Been on a constant search for luxury sheets, but can’t seem to find the right set? Well it’s time to introduce the new DreamFit sheets. DreamFit has created 7 different degrees of sheets with the goal of meting every sleepers needs, desires, and staying within budget. Will the DreamFit sheets come out swinging for the fences? Continue reading below to find out! Short on time? Click here to hop down to the review summary. For this Review, I tested the DreamFit 6 Degree Sheet Ensemable. These sheets are constructed from 100% Tencel fibers. Included in the set is an extra large flat sheet, a fitted sheet, and 2 reversible pillow cases. Additionally, the flat sheet is quilted, meaning it can serve as a lighter blanket or summer style comforter. The DreamFit sheets also use a sateen weave. The fitted sheet contains 4 bands along the corners of the sheet. These bands help to secure a tight fit around the mattress. In addition to the 4 corner bands is a DreamFlex band, which covers the entire bottom of the fitted sheet and once again reassures a snug wrap around the mattress. The fitted and flat sheets are larger than a traditional set, meaning they have the ability to serve thicker mattresses. Overall, the DreamFit sheets seem to be very well made. I determined this by examining the stitching, materials used, and overall construction. After taking a closer look at the stitching of these sheets, I was only able to locate 3 loose threads. With that said, these loose threads did not appear to affect the sheets in any way. One of these was found on the fitted sheet while the other two were noticed on the flat sheet. The pillow cases were flawlessly done and showed no signs of damage whatsoever. The four bands located on the bottom of the fitted sheet were tightly secured and did not show any signs of weakness or potential problems. During my testing of the DreamFit sheet set, I focused on a few of the main topics surrounding sheets. For starters, shrinkage. 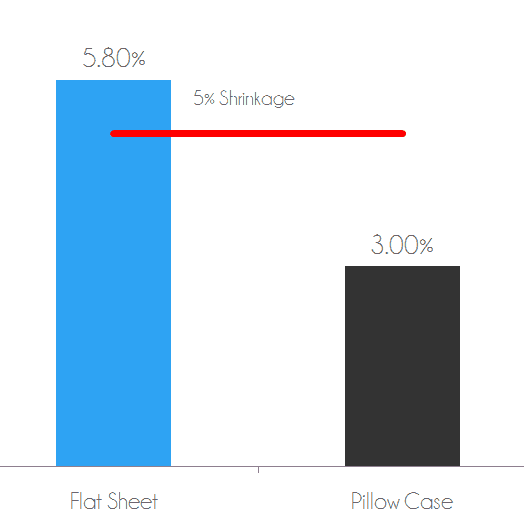 As we all know, shrinkage tends to be the most frustrating issue with regards to sheets. As a consumer, there needs to be some sort of promise assuring us that our expensive new sheet set is not going to shrink dramatically. Next up, thread examination and analysis. Are there any problematic loose threads? Have any new threads popped up or any existing become worse due to a normal wash / dry cycle? Finally, a color test. By testing the color / dye materials I am able to determine the quality of the colors used in the making of the DreamFit sheets. Shrinkage tests are extremely important. I can tell you first hand, this is one of the most aggravating experiences as a consumer. So to kick off the shrinkage test, I take initial measurements of the sheets and use them as my baseline for comparison. Next, I run the sheets through a standard wash / dry cycle. Once this step is complete, I take new measurements of the sheets. After comparing the baseline measurements to the new measurements, I saw 5.8% shrinkage in the flat sheet and 3.0% shrinkage in the pillow case. Any shrinkage that’s 5.0% or lower can be considered very good. The flat sheet was slightly above this threshold, but not so high that I am overly concerned. Shrinkage test – flat sheet shrank 5.8% after wash / dry. Pillow case shrank 3.0% after wash / dry. While completing my damage test I assess the sheets’ threads and overall stitching quality. 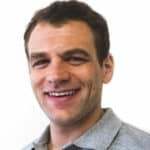 Typically, I am searching for any damage that could have come about after a few weeks of normal use and several wash / dry cycles. The DreamFit sheets proved to be made from high quality materials. After completion of my damage test I did not find any new issues with the sheets. The threads and stitching remained in good condition. Just as it sounds, the color test is designed to measure the quality of the color / dye materials used in the DreamFit sheets. 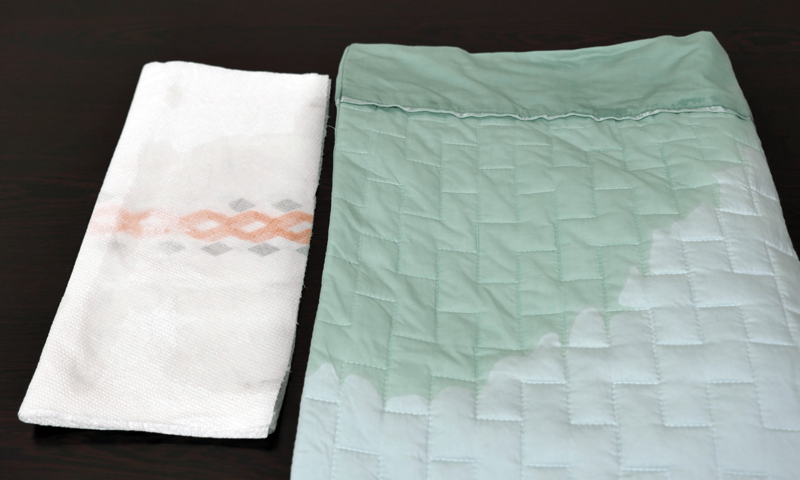 To begin the test I soak a pillow case in warm water and allow it to fully absorb the water. Once this is complete I ring out any potential excess water with my hands and lie the pillow case on top of a bed of paper towels. Next up, I firmly press a rolling pin against the pillow case and check the paper towel for any sort of color transfer. The DreamFit sheets did not show any signs of color transfer. The DreamFit sheets have quite a soft feel about them. While they are not the lightest sheets I have had the opportunity of testing, they are made of very soft material. Most sheet sets today do not include a quilted flat sheet, DreamFit 6 degree sheets do (Dreamfit sells other sheet sets that include a normal flat sheet). 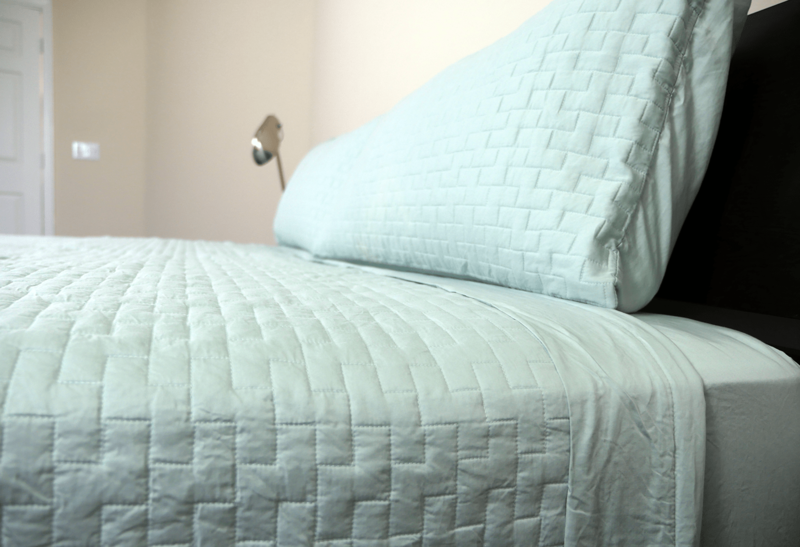 This slightly heavier, quilted sheet provides a level of softness you would not expect. On a scale of 1-10, where 1 is the softest, the Dreamfit sheets fall between a 3-4. One small complaint I had with these sheets was movement. As I rolled over or changed positions during the night, I would notice the sheets wanting to move with me. This was due to the flat sheet’s quilted construction. Basically, the flat sheet is sewn together from 2 layers, a thin and slightly thicker layer of Tencel. Although this combination makes for a comfortable feel, I was not a huge fan of how loose the thin layer of the quilted sheet was. As I stated above, the sheets would somewhat move with me during the night, usually resulting in a ball of sheets on one side of the mattress. With that said, the fitted sheet did have 4 color coded corner bands. These bands ensured a tight fit around the mattress and prevented the fitted sheet from ever randomly popping off. Instead, you can actually pull the fitted sheet (from the top) so hard that the bands will lift the mattress up. This is one of the most impressive fitted sheets I have seen to date. Cooling with these sheets was good. I did not feel warm while sleeping under the quilted flat sheet. In addition, the fitted sheet and pillow cases breathed well. With 7 different degrees (styles) of sheets and a variety of different colors, the DreamFit sheets embody a pleasing aesthetic. Whether you’re trying to match your bedroom set or simply add a more modern look to the bedroom, DreamFit has got you covered. Who Should Buy the DreamFit Sheets? Want 100% Tencel sheets – made from 100% Lyocell (aka Tencel), these sheets have an enjoyable soft feel and great cooling. Want a quilted flat sheet – the DreamFit 6 degree sheet sets includes a quilted flat sheet instead of the traditional smooth flat sheet. This can be beneficial for those who sleep warm and enjoy using a thick sheet instead of a comforter. Want a dependable fitted sheet – with 4 corner bands and an elastic band all covering the bottom of the fitted sheet this fitted sheet holds snugly. Additionally, the snug fit helps to ensure a tight and sleek aesthetic. Want several color and style options – with 7 different degrees (designs) of sheets and various color schemes within each of those degrees, DreamFit is able to cover many different sleeper preferences. Whether you’re looking to match a bedroom set or just want to liven up the bedroom, DreamFit is a good option. Looking for a little more information on the DreamFit sheets? Visit DreamFit.com. Constructed from 100% Lyocell (aka Tencel), the DreamFit 6 degree sheets have a luxurious, lived in feel about them. The quilted flat sheet is thick enough to replace a thin comforter, yet still able to breathe extremely well. 4 corner bands and an elastic band cover the bottom of the fitted sheet. This combination makes for a fitted sheet that will almost never slip off of your mattress. Even with an aggressive tug from the top, the bands are strong enough to lift the mattress into the air without slipping off of the mattress. If you’re looking to add some color, style, or luxury to your bedroom, the DreamFit sheets are a great option.